Situated in East Africa, Kenya has the highest gross domestic product (GDP) in East and Central Africa and its capital Nairobi is a regional commercial hub. However, it is still an extremely poor country. Approximately half of the population lives in absolute poverty and a large majority lack access to improved sanitation. It is estimated that 60% of the population in Nairobi live in slums, where the ratio of toilets to people is about one in 300. In June of 2010, Peepoople registered and incorporated Peepoople Kenya as a non-government organisation (NGO) in Kenya. Peepoople Kenya is the legal entity base for the initial launch project (ILP) in Nairobi, our first urban slum launch project in Kibera, as well as other Peepoople projects in Kenya. Besides in the slum Peepoo has successfully been tried in areas affected by floods and in refugee/IDP camps in Kenya. South Africa has a high unemployment rate and also ranks high in income inequality. In addition, the country has a low gross domestic product (GDP) per capita and high poverty rate. In contrast to many countries in similar situations, the informal economy of South Africa is not thriving. This is due in part to the fact that approximately 30% of the urban population resides in slums. Peepoople has conducted a test in the Durban slum. Climate change is becoming evident in countries like Pakistan where natural disasters have occured more frequently in recent years. In Pakistan alone, 20 million people were affected by floods in 2010, and 5 million more in 2011. In many emergency situations, access to adequate sanitation is one of the strongest determinants of survival by people in these types of emergencies. Climate change, coupled with conflicts and a measureable lag in achieving sanitation- and water-related Millennium Development Goals (MDGs) require new thinking for making the MDGs practical to achieve in Pakistan and elsewhere. According to UNICEF and WHO, 23% of the residents in Pakistan defecate in the open as a daily practice. A paradigm shift is necessary to harness the humanitarian assistance so that it contributes to long-term development and achievement of MDGs. A rights-based approach that addresses the needs of those at the bottom of the economic pyramid first, is the process that Peepoo is implementing. In Bangladesh, natural disasters induced by climate change affect the lives and livelihoods of tens of millions of residents and threaten to slow down, or even reverse progress made to alleviate poverty. 75% of the country lies less than 10 meters above sea level and 80% of Bangladesh is considered to be a flood plain. Consequently, residents throughout the country constantly face a high risk of flooding. Approximately 18% of Bangladesh’s surface is flooded each year, and has been measured at up to 75%. The destruction from these natural disasters has resulted in more than 7 million homes destroyed and 5,000 people killed. To date, Peepoople has conducted a project in Mymensingh, Bangladesh with a focus on slums. New Zealand is comprised of two main islands and a number of smaller ones distinguished by mountain ranges and volcanic activity. Earthquakes are common throughout the country, but in most cases, they are not too severe. Peepoople’s focus is not on Western markets or developed countries such as New Zealand. 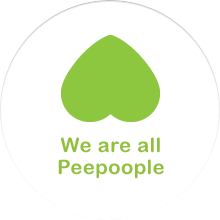 However, following a severe earthquake in 2011 in the capital city of Christchurch, Peepoo was distributed to people affected by this natural disaster. On January 12 2010, a 7.0 magnitude earthquake struck Haiti and devastated the capital, Port-au-Prince. More than 200,000 people were killed, and more than 1.5 million residents were displaced. The government was disabled and infrastructure decimated. When the earthquake hit, it effectively destroyed water and sanitation systems near the epicentre. As a result, more than 1.5 million people were left without access to safe drinking water or toilets. Even before the earthquake, Haiti was the poorest country in the Western Hemisphere. 80% of the population lives under the poverty line and the water and sanitation facilities that were in place prior to the disaster were chronically under-developed. According to UNICEF and WHO, 28% of the population practices open defecation. In rural areas the amount is as high as 49%. Between 1995 and 2012 there was only a 3% decrease in access to sanitation facilities. Philippines, officially Republic of the Philippines is a sovereign island country in Southeast Asia situated in the western Pacific Ocean. Its location on the Pacific Ring of Fire and close to the equator make the Philippines prone to earthquakes and typhoons. Approximately 98 735 000 people live in the country, making it one of the most populous countries in Asia. Approximately one-third of the country’s population lives in poverty, and for many families, inadequate sanitation is a serious problem. Around 25 people die every day from diarrhea caused by poor water sanitation in the Philippines, According to the “Philippines resource book and decision aid”, a report published by the United Nations’ Department of Economic and Social Affairs in 2005. In poverty-stricken communities, outbreaks of waterborne diseases are common. Democratic Republic of Congo, DRC, is a country located in the African Great Lakes region of Central Africa. It is the second largest country in Africa by area and the eleventh largest in the world. With a population of over 75 million, the Democratic Republic of the Congo is the nineteenth most populous nation in the world, the fourth most populous nation in Africa. Armed conflicts have torn the country apart for many years and there have been serious abuses against civilians. The population have been hard-hit by widespread war crimes, including summary executions, rapes, and forced recruitment of children. As a result of the latest conflict, beginning in 1998, more than 5.4 million people have died. More than 90% of these were not killed in combat, dying instead from malaria, diarrhoea, pneumonia and malnutrition, aggravated by displaced populations living in unsanitary and over-crowded conditions that lacked access to shelter, water, sanitation, food and medicine (resucue.org). The area in northeast DRC, around Goma, has been severely affected by the conflicts and the internal displacement of refugees. Upon this the people of Goma were in 2002 victims of the Volcano Nyiragongo’s eruption, which devastated 40% of the city. Syria, officially the Syrian Arab Republic. The modern Syrian state was established after the first World War as a French mandate, and represented the largest Arab state to emerge from the formerly Ottoman-ruled Arab Levant. It gained independence in April 1946, as a parliamentary republic. Its capital Damascus is among the oldest continuously-inhabited cities in the world. The Republic of South Sudan gained its independence from Sudan in 2011. South Sudan is bordered by the Republic of the Sudan to the north, Ethiopia to the east, Kenya to the southeast, Uganda to the south, the Democratic Republic of the Congo to the southwest, and the Central African Republic to the west. The country has suffered from internal conflict since its independence and in December 2013 a violent war broke out. The situation is still serious and 1,9 million people have been displaced and the needs are enormous.